Josh Triplett in Touch. Photo by Lauren Morrison. BOTTOM LINE: An astronomer mourns his wife’s disappearance as he and those around him search for connection. Live theater is all about human connection. It brings people together in a way no other medium can, telling stories in intimate environments and in real time. Because of these unique advantages, many writers choose to explore themes of connection in their plays, exploring how we as people navigate our relationships, the world around us, and even the cosmos. In her play Touch, Toni Press-Coffman invites the audience to ponder big questions of meaning through the lens of one man’s struggle to make sense of a senseless act. The play begins with Kyle (Josh Triplett), an astronomer, telling the audience his life story. The sparse set consists of several chairs and a window, all adorned with Christmas lights, and two small rock piles on either side of the stage. Kyle begins by bringing one of the chairs center stage and sitting down, inviting those in attendance to help him understand the confusing events of his life. He starts with his childhood, which was marked by a love of science, especially physics and astronomy. In high school, he discovers a different kind of love...Zoe. Zoe is the free spirited opposite of Kyle; her devil-may-care attitude is the perfect antidote for his pretension. The two begin a whirlwind romance and marry before either goes to college. Listening to Kyle’s florid descriptions of his lover and their relationship, and knowing there were two female actors in the show, I expected Zoe to spontaneously appear, either in the flesh or in a vision. I soon realized, as Kyle’s story took a turn for the worse, that no such sighting would occur. 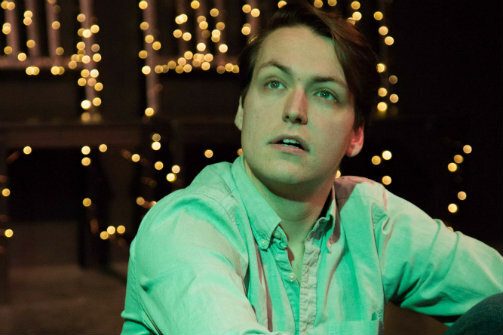 As Kyle tells of the night his wife disappears, he is joined onstage by Bennie (Alex Etling), his childhood best friend, and Kyle’s monologue gives way to a tense scene between the two men. Bennie is trying to assure his friend that everything will be all right, that Zoe will be all right, but Kyle is not hearing it. The identity of one of the female actors is soon revealed to be Zoe’s fiery sister Serena (Cassie Wood), who joins the two men in their search. Together, the three learn of Zoe’s horrific fate. As much as this may seem like a spoiler, the play is really about what happens after Zoe’s death. As Kyle, Bennie, and Serena try to make sense of what has happened, they seek comfort in unlikely places. For Bennie and Serena, their solace comes from their budding romantic relationship; for Kyle, a prostitute. Kathleen (a refreshingly lively Kiley Caughey), initially views Kyle as just another customer, and treats him as such. She doesn’t kiss him on the first “date” and refuses to sleep with him without a condom. As he continues to visit her, however, she realizes that there’s more to this man than meets the eye. Kathleen begins to take a real interest in her mysterious client, and their relationship becomes just the connection Kyle needs to cope with his unspeakable pain. From the scientific protagonist grappling with emotion to the prostitute with a heart of gold, Touch is a pastiche of dramatic tropes. Press-Coffman has left no stone of sentimentality unturned in her search for profundity. Ultimately, the play, like its characters, is seeking a deeper emotional connection with the audience than it has the capacity to afford. Director James Masciovecchio has picked the right set and setting to attempt that connection, though, tailoring his pleasantly starry scenescape to the friendly confines of downtown standby UNDER St. Mark’s. The actors’ staging is appropriate as well, with no props or discernable costumes to mask the vulnerability in which their characters are perpetually wreathed. English Romantic poet John Keats, platonic ideal of Touch’s Kyle, once wrote, “the poetry of the Earth is never dead.” Shows like Touch prove Keats’ words, showing us that there are as many stories left to tell as there are stars in the sky. With each new tale comes a new attempt at connection, at something more, at creating a truthful dialogue between speaker and listener. Without this pursuit, theater is meaningless. With it, it is boundless as the night sky. Touch is written by Toni Press-Coffman and directed by James Masciovecchio. It is produced by Cave Theatre Company and Frigid New York @ Horse Trade. Set, lighting, sound, and costume design by Cave Theatre Company. The cast includes Kiley Caughey, Alex Etling, Josh Triplett, and Cassie Wood.